Correlation is dependence without completely regular fluctuation. It is not possible to take into account the influence of all change in all factors simultaneously. Regression is dependence on central tendencies of one or more variables. And now the heart of the problem. 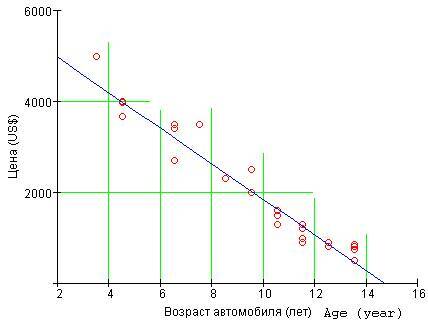 By chance the author found in the Internet (http://collab.mathsoft.com/read?8889,34) the following correlation data (see the table – Price of an Old Car, Depending on Its Age and Mileage). Also, regression analysis was requested. More specifically, the request was to give a formula or graph that could be used for an appraisal of the price of an old car by the year of manufacture and the odometer reading (mileage). 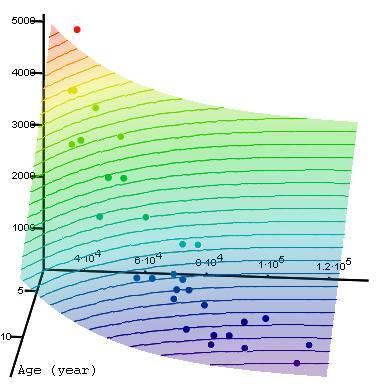 This author saw the question as an excellent example of problems that can be solved using MathCad. .
As a rule, one should begin regressive analysis (search for regression) with visualization of the tabular data – see fig. 1, fig. 2, fig. 3 and fig. 4, where the parameters of cars are shown in volume (fig. 1). Three different views are given (fig. 2, fig. 3 and fig. 4). Lines that describe following laws are lined in fig. 2, fig. 3 and fig. 4. 1. 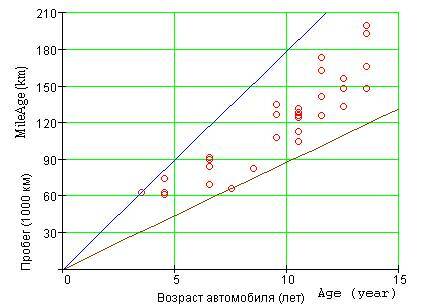 Correlation of the mileage of a car and its age is limited by two considerations: maximum and minimum average speed of the car. In our sample, we have: 1.004 km/h (7.5 years and 41,000 miles) and 2.046 km/h (3.5 years and 39,000 miles). 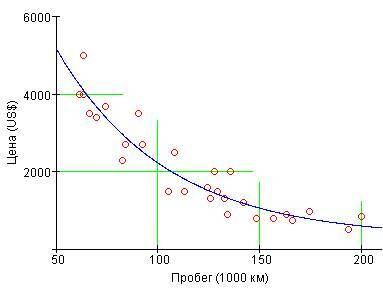 Hence, we can conclude – if you receive an offer to buy an old car, and the parameters do not fall into our high-speed «wedge» (1-2 km/h), then either the car was operated too actively (speed is more than 2 km/h), or the car was parked for some reason for a very long time (speed is less than 1 km/h), OR someone illegally tampered with the odometer. The car's age is more difficult to hide. 2. 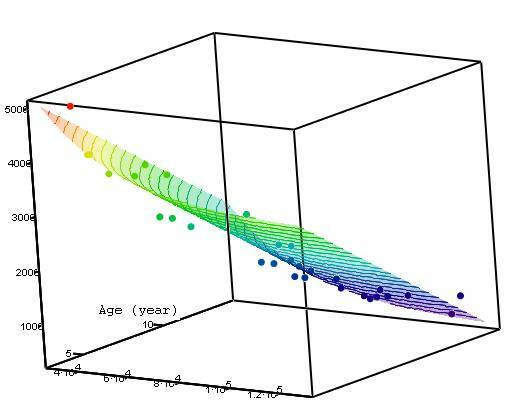 A car's price appears to have linear dependence on age (a + b x – fig. 3). It is difficult to define more elaborate dependence from the points left on the graph fig. 3. In our case, after every year of use, the price of a car, on average, decreases 393 dollars. 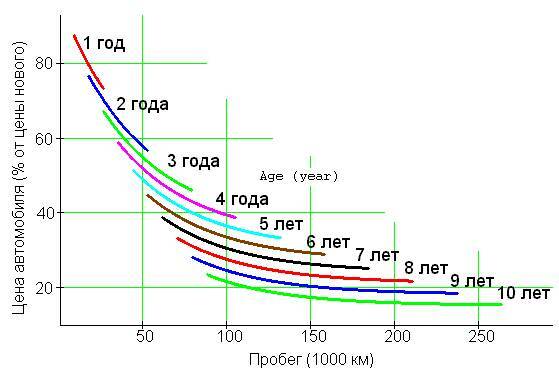 where: Age is shown in years, but Mileage is shown in kilometers. From this view we can see (fig. 6) that some of the points are above the surface and some are under the surface. This is the direct result of the least squares criterion: the sum of squares of deviations from the surface. The same criterion was used for determining lines near points fig. 3 and fig. 4. By the graph in fig. 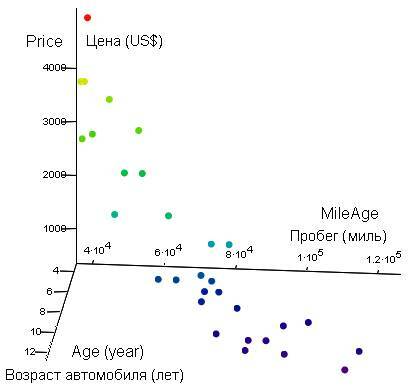 7 it is possible to determine both the price of a car and to discard cars outside acceptable limits, as shown in fig.2. Mathcad-document performing the required calculations: (Car_Price.mcd – Mathcad 2001 Premium). See: ftp://twt.mpei.ac.ru/ochkov/Auto. To quote Winston Churchill "There are lies, _______ lies, and Statistics" – the last being the hero of this article. In our table, data about one model of the car are collected. Other factors can influence the price of an old car: storage conditions (garage or street), maintenance record, and etc., but we shall take into account only two the chosen factors – age and mileage. These two words (age and mileage) flow together in English – MileAge, age, that are expressed in miles (1 mile ≈ 1609 м). In our sampling we have 9037 dollars. This must be increased 20-30% – the price of a new car decreases abruptly when it leaves the dealer's lot.